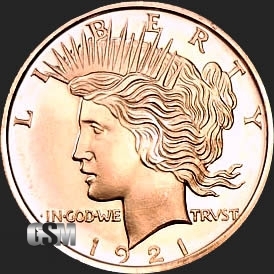 Originally designed by Anthony de Francisci, the Peace Dollar coin was the result of a competition to find designs emblematic of peace and was stuck in silver in 1921 and was the last dollar coin struck in silver. 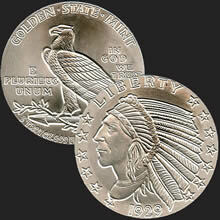 The obverse dipicts the profile of Lady Liberty . 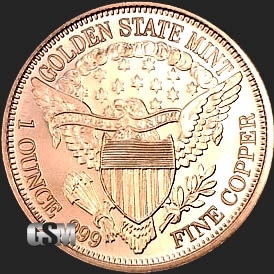 The reverse depicts a Bald Eagle at rest clutching an olive branch, with the legend "Peace". 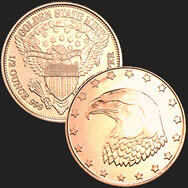 It was the last United States dollar coin to be struck in silver for circulation. 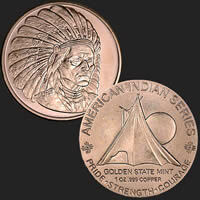 Copper is a valuable commodity, but it is important to buy pure copper because other metals depreciate in value. Invest in your future with a good collection of the Peace Dollar Rounds in 1 ounce increments, perfect for storing and saving until you are ready to sell. 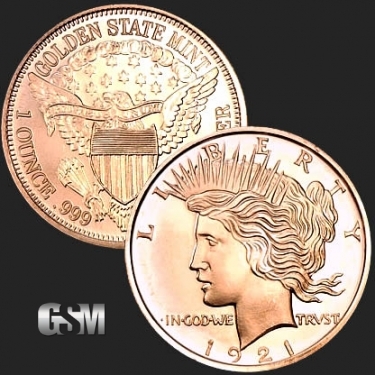 If you liked this product, you should check out our 1 oz Copper Statue of Liberty, 1/2 oz Copper Morgan, and 1/4 oz Copper Eagle Head.